(Estestvennye i Tekhnicheskie Nauki) 2004, Iss.6, p.70-72. In Russian. Some cases show that Himalayan yeti footprints on snow often misidentified as tracks of a bear. At beginning of 1983 naturalist Daniel Taylor-Ide  had guided small expedition to the Himalayan valley along Barun river, that inflows to larger river Arun. He reached near to the places where E.Cronin had taken photographs of yeti tracks early . In the first March days the expedition had risen to middle regions of the valley and had arranged a permanent camp on Barun bank. From this the travelers made walk routes in different directions. At the very first route up to highlands Daniel Taylor-Ide and Nick Ide raised to the upper border of thick rhododendron and bamboo bushes from where fields of snow are laid. There they have found out a line of tracks which appeared out a bamboo thicket, followed upwards the valley, and came to an almost vertical rocks covered with moss. Strides seemed to be alike to human, prints of right and left barefooted legs were easily identified. The length of a step was 28 inches (71 cm), length of the footprint ¾ 6,7 inches (17 cm), and width ¾ 4,8 inches (12 cm). Taylor-Ide had noticed, that many traces were shallow and clear, without any signs of being overlapped. On the cliff some bunches of broken bamboo had a form as though the animal grasped them for support. Scratched nail marks were seen on some of them. Scratches in moss on the cliff showed how the animal put its legs on ascent. Precise prints showed toes without claws. In one place yeti came to a bent shrub at 1,2 m high. The yeti raised the branch by its hand and passed under it without touching snow by four legs. It left visible scratches from its nails on the branch. It was clear that the animal had passed there recently, as the tracks were not melted (Fig.1). The observation was approximately three miles below from place where E.Cronin saw yeti tracks in his camp in 1981. Fig.1. A yeti track from Barun valley by Daniel Taylor-Ide. At first Daniel and Nick were sure, that the tracks they found belong to yeti. But after a week two familiar local hunters, experts on the Himalayan fauna, came to the camp. They were uncertain, that tracks they were told about (they did not see the tracks by themselves, because they were melted already), have been left by yeti. They told that there is small tree bear in the woods. Its adult weight does not exceed 75 kg lives in these foothills, and often it weighs 45 kg. The hunters insisted that forepaws of this bear are similar to human and they used to seize branches with the paws. It allegedly capable to take and hold different things with these paws like a human. It has a claw on inner side of the paws approximately in the same place where human hand has thumb. This bear allegedly leaves such tracks with the forepaws that are nearly alike to human handprints. One of the hunters had a cranium and dried front and hind paws of such a bear. Taylor-Ide had bought these things brought them into the USA. Besides, he saw the small-sized she-bear, which was not younger than 5 years old, in Katmandu Zoo. Taylor-Ide examined it and found out, that its front paw had no claw on the inner toe, which seemed shorter than other toes. It made an impression on him though the reason of claw loss was unknown to zoo servants. When Talor-Ide arrived home and got developed slides, he compared footprint images to the front paw. As he wrote, both contours had completely coincided. Under prints of toes he saw some holes that he took for claw marks. He decided that such marks can’t be made by nails of primates. There is no picture of dried paws in the book that would help to thorough judge on image and paw identity. After these comparisons of the tracks Daniel Taylor-Ide became the convinced supporter of the bear hypothesis. ¾ If it was a front bear paw, its claws would leave marks not inside contour of toes, but on some centimeters outside in front of the contour. Bear toes are incapable to turn so that the claws could be pushed in the snow under toes as it is visible in the picture. ¾ Proportions of the footprint in the snow show that it is longer than front bear paw and shorter than back one. If there was overlapping of hind paw on a front paw as sometimes happens at bears tracks the prints in the snow would be always longer, and it length would vary from one trace to other according to changes in depth of a snow and other circumstances. There could be double chains of claw marks from front and hind paws. An alive creature does not put its legs as mechanism. Daniel and Nick had noticed in a place of observation that no any signs of overlapping tracks were visible. ¾ Taylor-Ide track with value of its width and structure of a big toe that placed on inner side corresponds to Cronin track, but it is a little bit shorter than the last one. It can be due to an abrupt slope where it was found. The animal pushed their feet sharply in snow to keep itself steady at the slope. 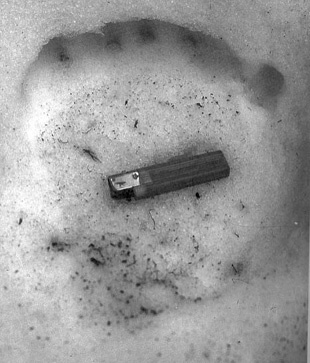 It is become obvious, that small marks under marks of toes which Taylor-Ide understood for prints of bear claws, are prints of thick strong nails of a primate. The big finger, departed to right from others, laid in the snow on its side and consequently had not left a mark from its nail. ¾ If it were the bear of any species, absence of seen close tracks from front and hind paws through all the way would mean that all found footprints were overlapped. Bears can not go on forepaws, having lifted its back part of body without touching ground by hind legs. Tracks of hind paws are always atop, and Taylor-Ide ought to compare the Fig.1 photo with the dried hind paw, not with the front one. It is easy to get confident, that discrepancies would be unacceptable to prove their unity. My conclusion: D.Taylor-Ide and E.Cronin found the tracks of same type that belong to small bipedal Himalayan primates of an unknown species. Apparently, such misunderstanding is typical. For example, tracks found and photographed by mountaineer Frank Smythe in 1937 have undergone similar erroneous treatment. It took place on a snow field at height of 20000 foots (6 thousand meters). Smythe followed tracks and made many photos, despite photo film cost a lot at that time. He described: "On the level the foot marks averaged 12 to 13 inches (30,5 - 33 cm) in length and 6 inches in breadth (15 cm), but uphill they averaged only 8 inches (20,3 cm) in length. The stride was some 1,5 to 2 feet (45 - 61 cm) on the level, but considerably less uphill, and the foot marks were turned outward at about the same angle as a man’s. There were well-defined imprints of five toes” . However, later some critics revised Smythe’s observation and attributed traces to black Asian bear Selanarctos thibetanus. They explained change in track sizes on the level and uphill by overlapping of front and hind legs ¾ at various slopes overlapping shows difference. Unfortunately, I have no Smythe’s photos for analysis. I only know that verbal descriptions often are too far from reality. The direct disagreement with opinions of critics is in the description of the observer (a bear directs, opposite to human, paws inside to stride). In my opinion, the situation is clear enough. By the size these tracks may be attributed to Shipton type, and on steep slope track length on snow surface became shorter, because hominoid push feet deep in the a snow for better stability (see Pierre Borde's photos [4.5]). I thank Bobbie Short for the books sent me as gift, that allowed to fulfil this research. 4. Bordet Pierre. Bulletin du Museum d'Histoire Naturelle de Paris. 1955. 5. Trachtengerts M.S.. Tracks of four-fingered Himalayan hominoids. "Natural and Technical Sciences" (Estestvennye i Tekhnicheskie Nauki) 2004, Iss.1, in Russian.